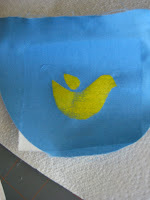 Here's the tutorial on the freezer paper stenciling I did on the pocket of the two in one dress. 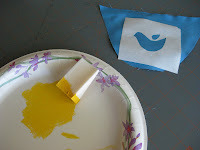 Panjokids has a great tutorial on these freezer paper stencils, and I just had to try it out. I had to laugh when I started because the author Ellie talks about not being able to find a regular artist's brush at home so she used an old cosmetic's brush. Believe it or not, I couldn't find mine either; they have since reappeared but only after I ended up using a makeup sponge! 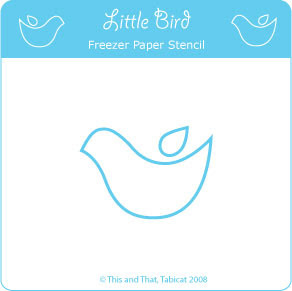 1.Trace your pattern onto the freezer paper. 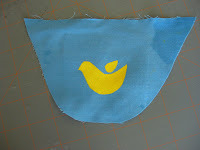 Make sure that the pattern is facing the correct direction when the shiny side of the freezer paper is down. 3. 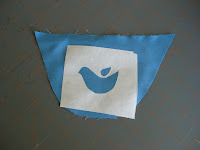 Place your pattern shiny side down on the fabric or item of clothing you wish to stencil on. Using a medium heat setting on your iron, iron your pattern to the fabric for a couple of seconds or until it sticks. I like to use the tip of my iron to go around the edges just to make sure they are firmly adhered. 4. Apply paint evenly to your brush or sponge. You may have to dab it a couple of times to remove the excess paint. Apply the paint to your stencil. I just dabbed it on using an up and down motion with my sponge. I had to do a couple of coats because the paint was so much lighter than the fabric. Okay, so I actually liked using the make-up sponge because it went on fairly evenly, and I could toss it at the end if I wanted. Kind of like my disposable paper plate pallet. I recommend using both if you are doing this project with kids. The picture above is actually from the back of the fabric. It makes a fun distressed look, so there's another option for you. Just be sure to reverse your pattern if you plan on painting from the back of the pattern. 5. 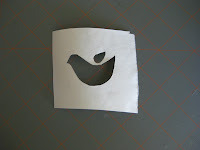 When the paint is dry, remove your stencil by carefully peeling it off. 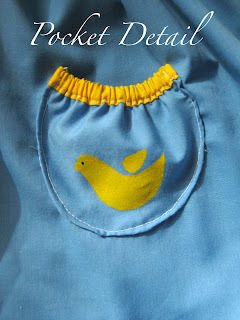 Click on the picture below to get my little bird pattern. LOVE IT! THANK YOU THANK YOU! I may do this in the next week or two as a gift. I've never used fabric paint before - will it wear well? Or will I need to wash it in a special way? You're the best! 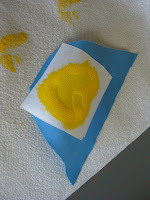 As far as I can tell, fabric paints wear well, just machine wash them inside out in warm water. Oh, and apparently you should wash the fabric before painting on it to remove the sizing. I just learned that. Too late for this little bird, but I figure it's so small and saturated the fabric so completely that it will probably be okay.